The Environmental Campus Organization (ECO), with the Mountain Biking Club, is looking for sponsors for the first Community-Sharing Bike Program. Applications are now available for writing consultants for the fall 2006 semester. The Truman women's swimming team gathers after winning the NCAA Division II Swimming and Diving Championships in Indianapolis March 11. 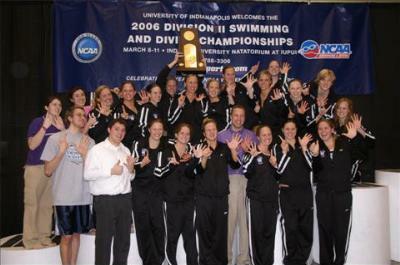 The Truman women's swimming team completed its run at history on March 11, winning the 2006 NCAA National Championship. With its sixth straight title, the team has won more championships than any other Division II women's swimming program. The Bulldog men finished just outside the top-10 with an 11th-place finish. The women's team scored 664 points at the meet, running away with the title. The closest competitor, like the previous five years, was Drury, which had 505 points. Drury won the men's title with 649 points. The Bulldogs finished 11th with 123 points, two shy of a tenth-place finish. Seventeen of Truman's 18 competitors came home with all-American or honorable mention all-American honors for scoring at the meet. Head coach Mark Gole was named the women's NCAA Division II National Coach of the Year in his first season at Truman’s head coach. The Kansas City Ballet will perform as part of the Truman Kohlenberg Lyceum Series at 7:30 p.m., March 29, in Baldwin Auditorium. Founded in 1957, the Kansas City Ballet is a 25-member professional dance company under the artistic direction of William Whitener. The Kansas City Ballet offers an eclectic repertory from the traditional classics to exciting contemporary ballets. This professional dance company is based in Kansas City, Mo., and serves the entire Midwest through its education, outreach, touring and residency activities. The artistic staff and dancers were trained at prestigious schools, ballet companies and training programs such as the Kansas City Ballet School, the School of American Ballet, the Joffrey Ballet, the Pacific Northwest Ballet, the Frankfurt Ballet, and the Boston, Washington, San Francisco and Pittsburgh Ballets. The Kansas City Ballet will be performing "Canzone," "Stravinsky Violin Concerto," and "Nine Sinatra Songs." Kraft Foods (Adair Foods) is a gold level sponsor of this event. Free tickets for this performance will be available beginning March 22 for students at the SAB Office and for faculty and staff in the CSI with University ID. Call 785.4016 for more information. Three Truman students had stellar performances at the Delta Sigma Rho-Tau Kappa Alpha national forensics honorary's annual national conference, held March 3-5, at the University of Houston. Elizabeth Hobbs, a senior biology major from Newton, Kan., placed in four national conference final rounds. Hobbs placed second in informative speaking, third in impromptu speaking, fourth in rhetorical criticism and sixth in persuasive speaking. For Hobbs, this caps an individual speaking events career that has included three previous years in elimination rounds of national championship tournaments. "Elizabeth has the distinction of making national elimination rounds each of her four years of competition, in three different national tournaments or conferences, and it is particularly gratifying to see her in these four final rounds," Kevin Minch, associate professor of communication and Truman's Director of Forensics, said. "We are looking forward to her final performance in individual events at the Interstate Oratorical Contest next month." Additionally, two Truman students captured speaker awards in parliamentary debate, having been narrowly edged-out of semifinals. Trevor Alexander, a senior economics and English double major from Gladstone, Mo., was seventh speaker in the tournament, while Chris Dove, a sophomore biology and sociology/anthropology double major from Chesterfield, Mo., placed fourth. Delta Sigma Rho-Tau Kappa Alpha (DSR-TKA) is one of two national honoraries students in four-year forensics programs can participate in, the other being Pi Kappa Delta (PKD), of which Truman is an affiliate. Pi Kappa Delta holds national conferences in alternating years. DSR-TKA's open-attendance policy at its national conference has offered students an alternative nationals opportunity in off-years and enabled students to broaden their range of national competitive experiences. In two weeks, each of these students will join nine others to represent Truman at the National Parliamentary Debate Association (NPDA) national championships at Oregon State University. Truman's season will conclude with Hobbs' appearance at the Interstate Oratorical Contest in late April. Seventeen students presented posters about their research at the Missouri State Capitol in Jefferson City recently. Pictured front row, left to right: Representative Bob Behnen, Nina Ellis-Hervey, Andrea Waldrop, Meghan Doherty, Jennifer Salmon, Kensey Riley and University President Barbara Dixon. Middle row, left to right: Matthew Kemp, Kristel Givogue, Joanna Ristow, Marcia Kottemann, Meredith Heist and Sherry Ritter. 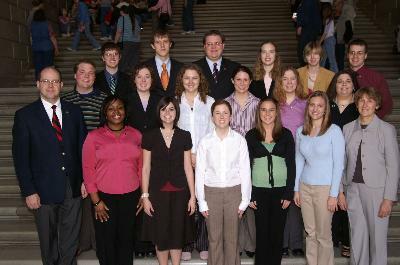 Back row, left to right: Chris Girouard, Keith Schnakenberg, Samuel Murphey, Ashley Lough, Courtney Bonney and Greg Day. The Truman State University Symphony Orchestra, under the direction of Sam McClure, will present its annual Gold Medal concert at 8 p.m., March 25, in Baldwin Auditorium. The winners of the Gold Medal Competition, the music department's annual student soloist competition, will perform with the orchestra. This year's winners are: Mary Stayton, soprano; Carol Carlson, violin; Sarah Billing, viola; and Avril Frick, piano. Ravel's "Rapsodie Espagnole" will be the featured orchestral work on the program. Kraft Foods (Adair Foods) is a gold level corporate sponsor of the Kohlenberg Lyceum Series. Kraft Foods (Adair Foods) will be recognized for its commitment to the Kohlenberg Lyceum Series at the Kansas City Ballet performance March 29. 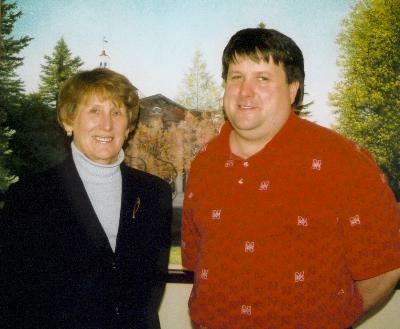 Pictured left to right: University President Barbara Dixon and Tim Anderson, human resources manager at Kraft Foods (Adair Foods) in Kirksville. The American Chemical Society (ACS) Scholars Program is accepting applications for the 2006-2007 academic year. The scholarship program is designed to encourage African-American, Hispanic and Native American students to pursue undergraduate college degrees in the chemical sciences. The American Chemical Society Scholars Program will award approximately 100 scholarships to undergraduate students interested in four-year degrees in the chemical sciences, those interested in transferring from two-year colleges to four-year colleges to pursue chemical science degrees, and two-year students intending to pursue degrees in chemical technology. The scholarship is $2,500 per academic year for freshmen, and up to $3,000 per academic year for sophomores, juniors and seniors. For further information regarding this scholarship, go to http://chemistry.org/scholars. The Beta Zeta chapter of Delta Kappa Gamma International, composed of women educators of Nodaway, Holt and Atchison counties, is offering a recruitment grant in the amount of approximately $120 to a young woman who has graduated from a high school in Atchison, Holt or Nodaway County in Missouri, declared a major in education and a GPA of 2.5 or above. Students must apply during the spring of the year before they student teach. Further information about this scholarship may be obtained from the Financial Aid Office. The postmark deadline for application is April 1. Student Senate would like to encourage all students, faculty and staff members to learn more about the candidates running for the Kirksville City Council and Kirksville School Board. A candidates' forum will take place at 7 p.m. at the Shrine Club. Candidates will be available to answer questions between 6-7 p.m.
Students interested in going to the event should meet at 6:30 p.m. at the SUB Down Under. Contact Lina at ljk402@truman.edu for more information. The organization plans to provide students, and perhaps the community, with an alternative to expensive and fuel-intensive vehicle use. By sponsoring a bike for a minimum of $10, an organization's name will be placed on the license plate of an ECO bike for a year, spreading the name of the organization across campus. where they can paint their own bike and participate in activities. For more information or to donate to the cause, contact Cassie Phillips at cassiephillips@care2.com. Several positions on Staff Council will become available in April. Staff members may only run for a position that is open in their assignment area/job classification. Those who are interested in running for an open position need to submit a statement of 100 words or less identifying who they are, their assignment area, and why they are interested in serving on Staff Council. All statements must be received at devanc@truman.edu or in person at the Human Resources office by March 22. Visit the Staff Council Web site at http://staffcouncil.truman.edu to determine which area their department/division falls under and how many openings are available. Contact Human Resources at 785.4031 for more information or questions. "CAFTA from the Central American Perspective"
Call the Center for Teaching and Learning at ctl@truman.edu for more information. New this semester, the Writing Center will also have an opening for a Spanish consultant. Students can pick up an application in the Writing Center, McClain Hall 303, or online at http://writingcenter.truman.edu. Writers from all disciplines are encouraged to apply. Events throughout the week will highlight the diversity of Truman's campus with fun and educational programming. Presented by Student Senate in conjunction with various student organizations and campus offices. Contact Matthew A. Seibert at 660.349.0531 or mas602@truman.edu for more information. Admission is free for members of the University community. There will be a reception for Dash in the Violette Commons (second floor) after his talk. Dash is a founding member of the National Association of Black Journalists, and he is recognized as the creator of immersion journalism. He has authored or coauthored several books, including "The Shame of the Prisons," "When Children Want Children: The Urban Crisis in Teenage Childbearing" and "Rosa Lee: A Mother and Her Family in Urban America," which he based on the award-winning newspaper series. Dash is now a permanent faculty member at the University of Illinois (Urbana-Champaign) Center for Advanced Studies. For more information, contact Karon Speckman, associate professor of communication: journalism and SPJ adviser, at 785.7231. Papers and presentations from all disciplines and backgrounds will be accepted. Proposals will be accepted through April 1. Conference and Art Show submissions are opened for students, faculty, staff and Kirksville community members. To submit a proposal, e-mail a concise abstract to cassiephillips@care2.com. The summer and fall 2006 open course lists are currently available via TruView. Additional registration information, including registration dates, is available at http://registrar.truman.edu. Printed schedules will be available after spring break. Marek Haruza, a junior physics and mathematics double major from Worth, Ill., and Bec Hanania, a senior chemistry and physics double major from Hanover Park, Ill., presented posters at the Arkansas INBRE conference that took place Feb. 24-25, in Fayetteville, Ark. Haruza's poster, titled "Laser Cooling and Trapping of Rubidium Atoms," was awarded third place in the physics section of the conference. The poster was based on the work of and put together by the Quantum Optics research group mentored by Michael Goggin, associate professor of physics, who also drove the students to the meeting. The other students who worked on the poster were David Kiblinger, a sophomore physics and mathematics double major from Cape Girardeau, Mo. ; Ross Coleman, a junior physics major from Springfield, Mo. ; and Stan Park, a junior computer science major from Joplin, Mo. Hanania's poster, titled "Mechanism and Stereochemistry of the Alkaline Hydrolysis of a VX Stimulant," was the result of her summer 2005 research project funded by the National Science Foundation through Truman's NextSTEP program and mentored by Eric Patterson, associate professor of chemistry. Oleksiy Golovin, a junior physics major from Kiev, Ukraine, also attended the meeting. Barbara Price, associate professor of English education, attended the Missouri Association of Teachers of English Write to Learn conference Feb. 17-18 in Osage Beach. Price is a member of the MATE board. Also attending was Alaina Denney, an English M.A.E. student from Independence, Mo., who was named Truman's recipient of the 2006 Robert J. Greef Award, presented annually by MATE. Truman's chapter of Beta Theta Pi Fraternity has recently raised $1,700 through a date auction and the Beta Theta Pi Spike Volleyball tournament, supplemented by donations from parents, to benefit Hope's Kitchen. The Collegiate Farm Bureau will sponsor an Alternative Fuel Source Forum from 6-8 p.m., March 21, in VH 1000. This will be an informative event on the sources of alternative energy within Missouri, featuring a panel of experts offering a variety of viewpoints. Contact Jennifer Lane at 627.5963 or jml600@truman.edu for more information. The DEPThS group will discuss Astral Projection at 8 p.m., March 21, in BH 249. DEPThS is a student-led open discussion group about spirituality. E-mail depths.tsu@gmail.com for more information. The Center for Teaching and Learning Weekly Lunch Series will kick off their annual spring emphasis on "Academic Integrity" from 12:30-1:30 p.m., March 22, in the SUB Spanish Room. Members of Truman's Institutional Review Board (IRB) will discuss what they do and why it matters. Call 785.4391 for more information. The Graduate Council will meet from 3:30-5 p.m., March 22. Contact Crista Chappell at 785.4109 or gradinfo@truman.edu for more information. "Should You Really be a Lawyer?" discussion will take place from 4:30-5:15 p.m., March 22, March 29, April 5 and April 12, in VH 1146. Marty Jayne and Paul Parker, Truman pre-law advisers, will discuss legal education and legal careers with all interested students. Contact Parker at 785.4505 for more information. Campus Christian Fellowship will have their weekly meeting at 7 p.m., March 22, in VH 1000. The Division of Education and the Division of Language and Literature will sponsor an informational meeting about the Truman-China English Teaching Partnership at 7 p.m., March 23, in MC 305. Students will teach conversational English in the WuHua County Public Schools during fall 2006 and spring 2007. Contact Amy Peebles at apeebles@truman.edu for more information. The Observatory will be open to the public, weather permitting, from 8-10 p.m., March 23, at the University Farm. Go to http://observatory.truman.edu for more information. Staff Council will again sponsor a team for the American Cancer Society's Relay for Life. This is the signature fund-raising event for the organization and will take place April 21-22. The registration deadline is March 24. Interested parties may contact Jennifer Thompson at 785.7252 or jthompson@truman.edu for registration packets or additional information. The Student Activities Board will be showing "Harry Potter and the Goblet of Fire" at 6:30 p.m. and 9 p.m., March 24, and at 3 p.m., March 25, in VH 1000. No tickets are needed. Call 785.4722 for details. Circle K will co-sponsor an all-you-can-eat Pancake Breakfast and Raffle from 7 a.m.-1 p.m., March 25. Tickets cost $4 in advance and $5 at the door. Proceeds will benefit Habitat for Humanity. For tickets, contact a Circle K member. Contact Jennifer Thompson at 785.7252 or jenthompson@cableone.net for more information. The NEMO Folk Symposium will take place from 8:30 a.m.-5 p.m., March 25. The Symposium features exhibits from the Quilters' Guild, the Missouri Folklore Society and other, plus a story-recording booth. This event is free and open to the public. Contact Meredith Heist at 636.577.1573 or mmh919@truman.edu or Betsy Delmonico at 665.0273 or bdelmoni@truman.edu for more information. Truman State University will be hosting the 9th Annual Truman Open Track & Field Meet on March 25, beginning at 10:30 a.m. Any students, faculty or staff wishing to help with this meet should contact John Cochrane at 785.4341 or cochrane@truman.edu or Christina Winkler at 785.4342 or cwinkler@truman.edu. No experience is necessary. The Rotaract Club will present the third film of its International Film Series, "Ma Vie En Rose," at 6:30 p.m., March 25, in VH 1000. Contact Brynn Weimer at 665.3452 or bew935@truman.edu for more information. The Spanish Club will show the film "Maria Full of Grace," the story of a Columbian teenager who becomes a drug mule to make money for her family, at 7 p.m., March 25, in BH 176. Admission is free. Contact Hillarey Stone at hks136@truman.edu for more information. Renee Gordon is having a Vocal Recital at 2 p.m., March 26, in the OP Performance Hall. Contact Gordon at rmg096@truman.edu for more information. The Muslim Students Association will sponsor a showing of the movie "Kingdom of Heaven" at 7 p.m., March 26, in the SUB Activities Room, to get students thinking about the issues of how Islam is portrayed in Hollywood and how the movies compare to the real thing. Contact Andrea Cluck at 785.5837 or aec600@truman.edu for more information. The Muslim Students Association will sponsor a presentation by Imam Mohammed Nabeel Khan titled "Islam: The Truth Revealed" from 7-9 p.m., March 27, in BH 251. The Imam will reveal the truth about the world's fastest-growing religion and clear up pressing issues with an eye-opening speech and question and answer session. People of all faiths are encouraged to attend. Contact Andrea Cluck at 785.5837 or aec600@truman.edu for more information. The Center for Teaching and Learning will sponsor the Assessment Colloquium "Creating Student Learning Outcomes" from 4:30-6 p.m., March 28, in the SUB Conference Room. Contact the Center for Teaching and Learning at 785.4391 or ctl@truman.edu for more information. The Muslim Students Association will present an interfaith discussion panel titled "Three Faiths, One God" from 6-8 p.m., March 28, in the BH Little Theatre. Jews, Muslims and Christians will answer questions about how the three faiths compare in an audience-focused discussion panel. Questions on controversial issues will be answered, providing a clear picture of how Islam fits in with Judaism and Christianity. Contact Andrea Cluck at 785.5837 or aec600@truman.edu for more information. The Student Activities Board and the Student Union will sponsor an Open Mic Night from 8-11 p.m., March 28, in the SUB Activities Room. The event will be a night of art and musical performances in a relaxed atmosphere. E-mail Dan Kling at d4001@truman.edu for more information. The SERVE Center is accepting applications for the fall 2006 semester for work-study and scholarship positions only. Applications are available in the Center for Student Involvement, located on the lower level of the SUB. Completed applications should be returned to the CSI by 5 p.m., March 29. The Women's and Gender Studies Committee will sponsor the Gender and Empire Conference from March 30-April 1 on campus. The conference is the 11th Annual Women's and Gender Studies Conference. Presenters will include undergraduate students, graduate students and faculty. Log on to http://ll.truman.edu/ws.html or contact Linda Seidel at 785.4491 or lseidel@truman.edu for more information. The International Club will be sponsoring the International Idol at 7 p.m., March 31, in Baldwin Auditorium. International students and some of their American friends will perform songs, dances and other arts from across the world. A panel of judges will decide on a winner. These acts are interspersed with guest performances, which are not judged. Staff Council will again sponsor a team for the American Cancer Society's Relay for Life. This is the signature fund-raising event for the organization and will take place April 21-22. The registration deadline is nearing. Interested parties may contact Jennifer Thompson at 785.7252 or jthompson@truman.edu for registration packets or additional information. The Special Olympics Northeast Area Track and Field Games are looking for volunteers to be buddies to athletes from 9 a.m.-5:30 p.m., April 8, at Stokes Stadium. Volunteers for other aspects of the games are needed as well, with less of a time commitment. Those interested in volunteering should contact the Student Council for Exceptional Children at 627.6035 or scec@truman.edu. Human Resources, in cooperation with UniCare Life & Health Insurance Company, the University's medical insurance carrier, will be sponsoring the Faculty and Staff Health and Wellness Fair on April 14 in the SUB. More details will be announced in the future. For more information, contact Human Resources at 785.7480 or 785.4031. The 2006-2007 Free Application for Federal Student Aid (FAFSA) is available on the Web at http://www.fafsa.ed.gov. Apply soon to be considered for all available federal and state funds. Contact the Financial Aid Office, MC 103, 785.4130, if you have questions.